While doing SEO of any website we talk and do a lot on on-page and off-page optimization. We optimize website’s title and Meta tags, its content; we use H1 and H2 heading tags. We focus a lot on link building and try to get relevant and quality back-links. But what is it that we still done rank on the chosen keywords. There’s one thing that we often ignore or just forget to include in our SEO strategy which is website SILO. What is website SILO and how to implement it? A silo is nothing fancy. It is actually a term coined by Bruce Clay. A silo is simply a category or folder in which you place web pages related to the topic of the silo. We can define SILO in laymen’s terms as creating a specific category (as a landing page) and then creating nested posts within that category to support the themed / topic through the collective relevance and authority of the documents. In a SILO website the pages link selectively in sequence (to the post before or to the next post) in the series of posts or nested pages. 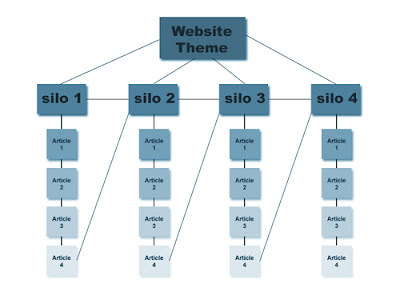 You can view the image below to get clearer picture of a good SILO structure for any website. So a website SILO helps in better indexation of website pages and crawlers find it easy to crawl website. Thus it helps in improving rankings.